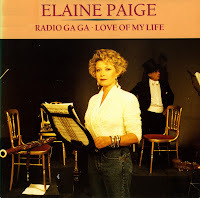 Elaine Paige released 'The Queen album' in 1989. It was an album with ten covers of tracks originally performed by Queen, performed with full orchestral backing. I didn't know the album until I found this single, containing great versions of 'Radio ga ga' and 'Love of my life'. The orchestral arrangements are beautiful, Elaine Paige's voice is pretty good as well, but still I have difficulty deciding whether I find this simply great or just a tad tacky. There is a certain camp element to Queen's work, and it may only get worse by treating it this way. Well anyway: listen for yourself; you decide!